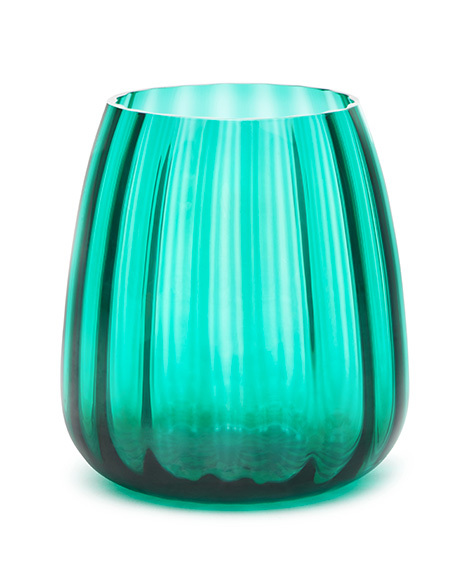 FASCINATED BY TWO OLD MURANO GLASS-BLOWING TECHNIQUES, NAMELY “BALLOTON” AND “RIGADIN”, WE DESIGNED TABLEWARE WITH FLUID GEOMETRIES WHICH CREATE DETAILS ON THE GLASS EVOKING THE NATURAL SURFACES OF FRUIT, PLANTS AND SEA WAVES. OLA IS A TABLE SET CHARACTERISED BY AN ELEGANT TROPICAL SPIRIT AND IT IS COMPOSED OF A GLASS AND A CARAFE WHICH CAN BE USED ALSO AS A VASE. 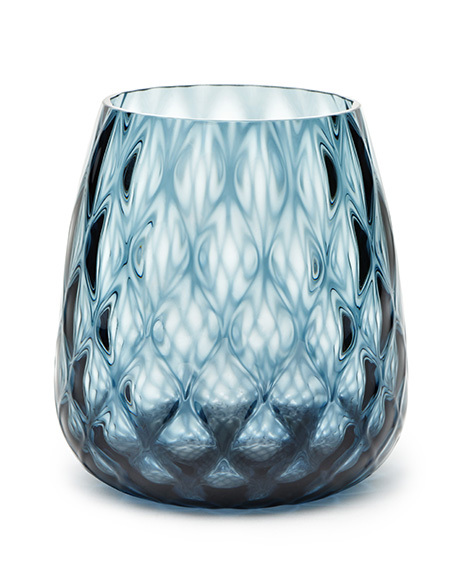 THE DETAILS OF THE SURFACE CREATED THANKS TO THE “BALLOTON” AND “RIGADIN” TECHNIQUES TRANSFORM THE GLASSES INTO TROPICAL FRUITS AND THE CARAFE INTO THE TRUNK OF A PALM TREE THANKS TO THE GEOMETRIC WAVES. AS ANY OTHER MURANO GLASS, NO JUG OR GLASS WILL BE EQUAL TO ANOTHER ONE. 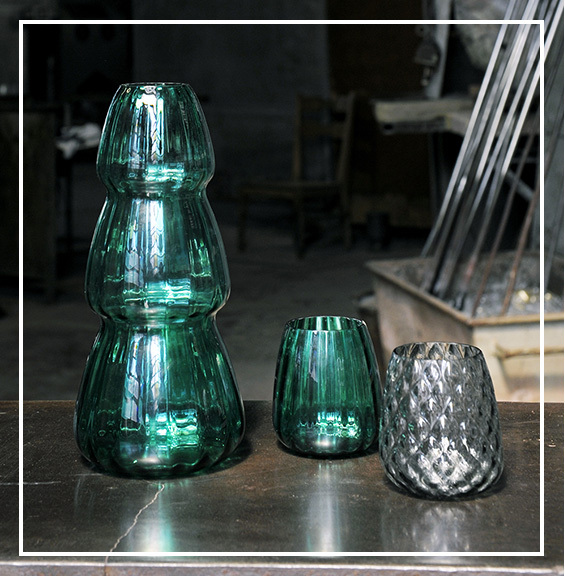 IT IS IN FACT IMPOSSIBLE TO CHECK THE RESULTS OF THE MANUFACTURING OBSERVING THE MARKS LEFT BY THE BRONZE MOLD BEFORE BLOWING THE JUG AND THE GLASS INSIDE THE PEAR-SHAPED MOLD THAT WILL GIVE THEM THE ULTIMATE SHAPE. AS A RESULT, EACH OBJECT WILL BE A UNIQUE AND ORIGINAL PRODUCT. 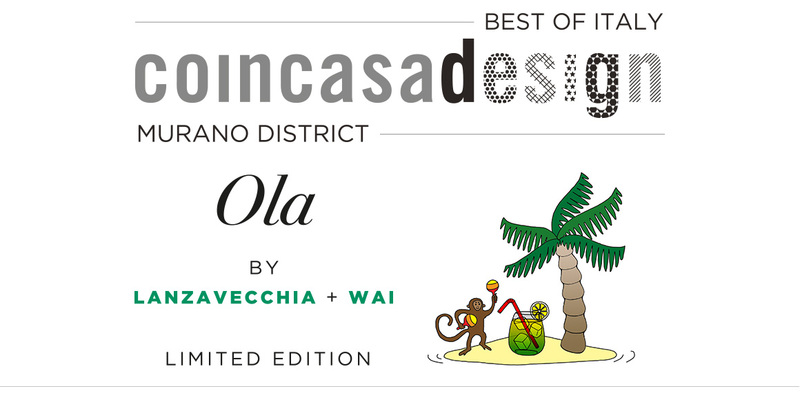 Lanzavecchia + Wai is a creative duo: she's from Italy, he's from Singapore. They met at the Design Academy of Eindhoven where both have a Master Degree in Design. In 2009 they founded the study bearing their name. For them, being a designer cannot ignore research, engineering, craftsmanship and storytelling. The key of their work is the result of their experiences and of their different cultural background The studio currently collaborates with numerous brands and has active international recognition including the YOUNG DESIGNER TALENT EDIDA 2014 award awarded by Elle Decor's international network.